Would you rather baseball be technically correct or invoke common sense and fair play in its Replay Review decisions: how close is too far? This philosophical quagmire manifests most frequently in the tag play at second base when a runner's foot slides into the bag and subsequently may or may not momentarily break contact with the white rubber square by fractions of an inch, all while the fielder holds a glove to the runner's leg. What's the correct call? Is Replay Review becoming too cumbersome? As of June 9 at 9am, the category of Replay Review known here as "Tag - Into Base" (and, occasionally, "Tag - Stolen Base") enjoys a Review Affirmation Percentage (RAP) during this 2018 season of 64.6% (53.7% for stolen bases, but bear in mind the SB figure rarely pertains to tags on runners where breaking contact with the base is an issue), which is better than the league average of 51.5% for all Replay Review categories, but perhaps we should consider an even greater subcategory of this classification: the Tag - Into Base [Broken Contact]. 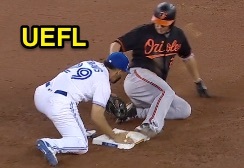 Such is the case of one particular play this weekend in Toronto, when 2B Umpire Ted Barrett's ruling that Orioles batter-runner Danny Valencia was out at second base at the hands of Blue Jays second baseman Devon Travis stood following a Baltimore challenge. When tmac reviewed this play, it received a flag for a potential Replay Review missed call: replays indicated clear and convincing evidence to suggest fielder Travis' initial tag attempt on runner Valencia missed the runner entirely, so why did New York uphold the out call? Travis may have tagged Valencia after all. Upon closer examination of the frame-by-frame coverage, not only did we confirm our original finding (that Travis missed Valencia on the slide into the base), but we also discovered that, after sliding safely into second base, Valencia's right foot may have broken contact with the bag afterward by fractions of an inch as Travis may have tagged Valencia's thigh. Accordingly, upholding Barrett's out call is technically the correct determination, but almost assuredly for a reason different than the one Barrett originally used in calling Valencia out. As Orioles Manager Buck Showalter was left shaking his head in the aftermath of the decision, we consider whether expanded replay has infiltrated the confines of common sense—or perhaps, changed what that term actually means. The Replay Review regulations are clear: whether a runner is safe or out as the result of a fielder's tag is a reviewable play, and the Official Baseball Rules pertaining to tags shall apply. Related Post: MLB Releases Replay Review Regulations for 2014 Season (3/31/14). For what it's worth, the relevant OBR items are 5.09(b)(4) ["Any runner is out when—He is tagged, when the ball is alive, while off his base"] and the definition stating, "A TAG is the action of a fielder in touching a base with his body while holding the ball securely and firmly in his hand or glove; or touching a runner with the ball, or with his hand or glove holding the ball (not including hanging laces alone), while holding the ball securely and firmly in his hand or glove." 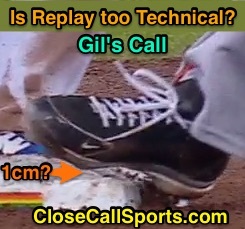 Gil's Call: Pursuant to OBR and Replay Review rules and regulations, the pop-up slide, like an overslide, places the runner in jeopardy of being tagged out, as in 5.09(b)(4). Such an out is not a force play (if applicable, and mainly relevant to potential time plays), but by now we know, there is absolutely no grace and no allowance granted for a runner whose cleat breaks contact with the base—not for a nanosecond, and not by a nanometer. Travis clearly misses on his initial tag attempt. Perhaps even I, with all my advocacy for adherence to the rules' technical idiosyncrasies, am too "old school" to even consider calling out a runner for nothing more than breaking contact with the base by a centimeter. It better be more apparent than that, at least in my faulty judgment. So while I personally despise the Travis-Valencia "call stands" determination, I must acknowledge that upholding the out call is the technically correct outcome. I would prefer seeing the runner called safe unless it's plainly obvious that his foot has left the bag entirely—by at least an inch or two—but the problem with that line of thinking is, first, what margin-of-grace should we afford the runner on a consistent basis, and, second, what rule would even support it? Per the rules, breaking contact with the base by as much as one Planck length—that's quantum physics—is enough to render the runner out, and we have high-speed, ultra-zoom, x-mo cameras absolutely chomping at the bit to overturn whatever call was initially made. Naturally, we have no realistic way of observing a Planck (1.62 x 10-35 m) on a baseball field, so the question regarding Travis-Valencia and all similar plays, then, becomes, how close of a margin can the technical eye discern? I posit this question because the laws of physics state that similar charges repel. Because all atoms are comprised of electrons, which are the outermost particles of an atom and have the characteristics of both a particle and a wave—not to mention a negative charge—the subatomic particles will naturally repel and, thus, never touch; in other words, you can never actually touch anything. Two objects can never truly "touch." Even when electrons jump atoms, they never actually touch. If the electrons defied impossibility and somehow managed to touch...well, they've made some very powerful and dangerous bombs about similar concepts; an electron bomb would be on a whole other, inconceivable level. Because of electromagnetic repulsion, it is quite literally impossible for a runner to ever touch a base, and equally impossible for a fielder to ever tag a runner. Accordingly, if we were to focus a subatomic microscope on any play at any base, not only would we see that the runner is not touching the base, we'd see the fielder is not tagging the runner. Everyone would be safe by default (because the defense could never legally appeal by touching the appropriate base...in NFHS or NCAA softball—leagues with dead ball and verbal appeals—I suppose every runner would be out on appeal) and games would never end (also, the pitcher would be throwing illegal pitches the entire game, for never having touched the pitcher's plate). Video: Enrico Pallazo ejects Joe West. Who knew? 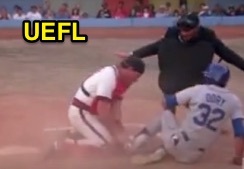 Enrico Pallazzo was actually right—the runner was safe! At some point this becomes rather ridiculous, but nonetheless illustrates what happens when visual capture technology continues to improve as the laws of physics stay the same. 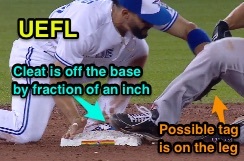 SIDEBAR: As long as we're being technical, it isn't that far of a logical leap for a broadcaster to incorrectly assume that if any leathery item touches the runner while the runner is off the base, it is a legal tag, even when the rules specifically state otherwise (which is why Toronto's "laces" statement was wrong). Is this a cerebral inconsistency within the rules themselves, an uneven application of common sense and fair play, or an appropriate jigsaw navigation of what the rules should be? Related Post: Commentary Critique - Glove Laces Not Part of Tag (6/4/18).